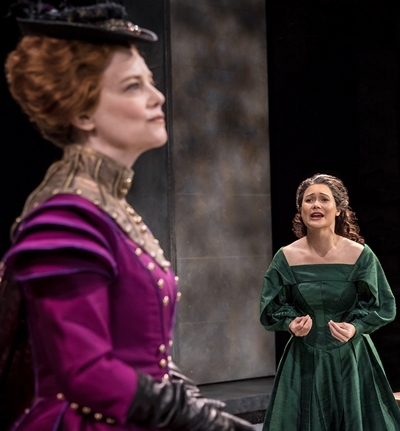 Interview: In title role of Schiller’s play at Chicago Shakespeare, actress found the lioness in the skin of a tender, vulnerable woman. Like the queen she plays, K.K. Moggie rules the stage in the title role of Schiller’s “Mary Stuart” at Chicago Shakespeare Theater. 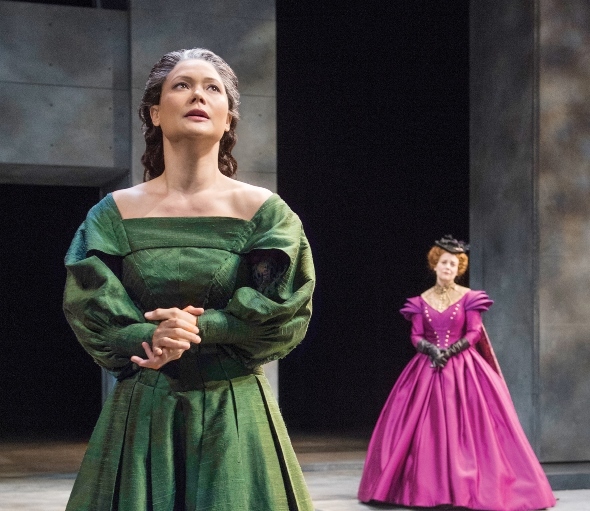 But what helped her get to that place, she says, was the realization that the play was less about the fallen Scottish queen – who aspires to the English throne even as she is held prisoner by Queen Elizabeth – than what’s going on around her. 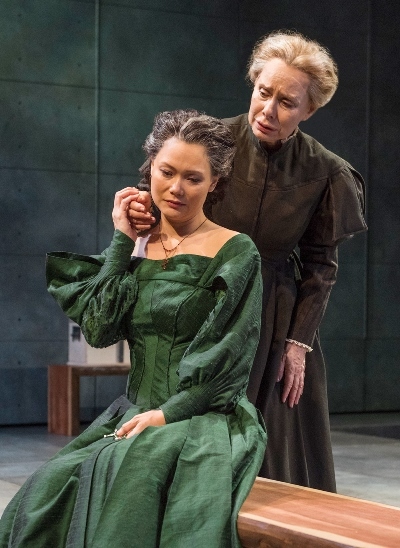 In Schiller’s play, originally in German and first produced in 1800, Mary has long languished under arrest, her former wealth stripped away and her only companion her faithful nurse from childhood (played by Barbara Robertson). Meanwhile, Elizabeth’s courtiers advise her both yea and nay on the issue of Mary’s life: While some urge Elizabeth to put her nemesis to death, others counsel forbearance lest she turn Mary into a martyr. “When I came to the first table reading, I was well prepared. I’d done a great deal of research, and I felt like I had ownership of the role,” says Moggie. “But then (director) Jenn Thompson started working into the character of Mary layer by layer until the colors were deeper, more refined and specific. It’s not that I was on the wrong track, but rather that we took our time going through Mary’s every emotional journey by very fine degrees. “We are really looking at two marvelous female creatures. Mary’s upbringing was of royal privilege. She lived at the French court from the age of 5. She grew up believing that her beauty and femininity were revered above all other qualities. She was the Kim Kardashian of her day. By the time we see her, she has lost everything. All she has left are her instincts and a conviction that she’s entitled to the crown Elizabeth now wears. 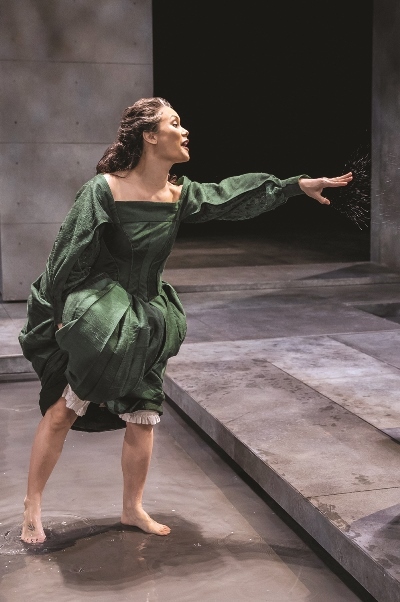 Moggie attributes the concentrated power of “Mary Stuart” to the elegance and specificity of Peter Oswald’s English-language adaptation. Mostly, this updated and streamlined text preserves the blank verse and largely the iambic pentameter pulse of Schiller’s original work. Inevitably, Moggie’s perspective on the imprisoned and bereft but ever defiant Mary evolved with each performance. Or as she puts it, “a sense of ease and freedom” began to settle in. The lioness is Mary transformed into a force of nature when Elizabeth shows up to confront her prisoner, unexpected and unannounced. Such a face to face meeting has been Mary’s fondest wish. But she’s utterly unprepared for it, and unwittingly set up for it. Elizabeth and her retinue come upon Mary just outside her prison walls, where she has been granted unusual freedom to revel in the sunlight and splash in a shallow pool. The meeting does not go well as Mary quickly erupts in a towering rage. That scene, says Moggie, is the highest hurdle she must clear at every performance. “This is where we put in our hardest work, and it’s different every night. Kellie (as Elizabeth) is so great to work with. We can really play ball. And there are so many different emotional responses happening at the same time. Imagine, this is a meeting 19 years in the making, and it’s fully charged. You have all these things you’re turned over in your head for so long, all these things you want to say – then the meeting suddenly, unexpectedly happens, and all that goes out the window. “That’s what’s so wonderful about the scene, this emotionally vibrant connection that everyone in the audience makes. It’s always the scene I have the most nerves about and the greatest high from. There’s so much adrenaline, so much trepidation beforehand: how much breathing I need to do, how warm my body has to be.